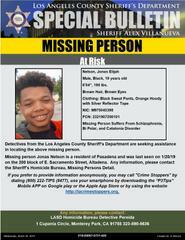 Los Angeles County Sheriff's Department Investigators from the Homicide Missing Persons Unit are asking for the public’s assistance in locating an At Risk Missing Person, Jonas Elijah Nelson a 19 year-old Black young man, who was last seen on Sunday, January 20, 2019, on the 200 block of East Sacramento Street, Altadena. Mr. Nelson is described as 6’04”, 190 lbs., has brown hair, and brown eyes. 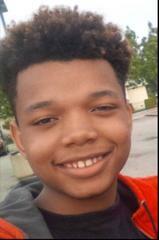 He was last seen wearing black sweat pants and an orange hoody with silver reflector tape. Mr. Nelson suffers from Schizophrenia, Bi Polar and Catatonia Disorder. They are asking for the public’s assistance in his safe return. Anyone with information about this missing person is encouraged to contact the Los Angeles County Sheriff's Department's Homicide Bureau Missing Person Unit at (323) 890-5500.